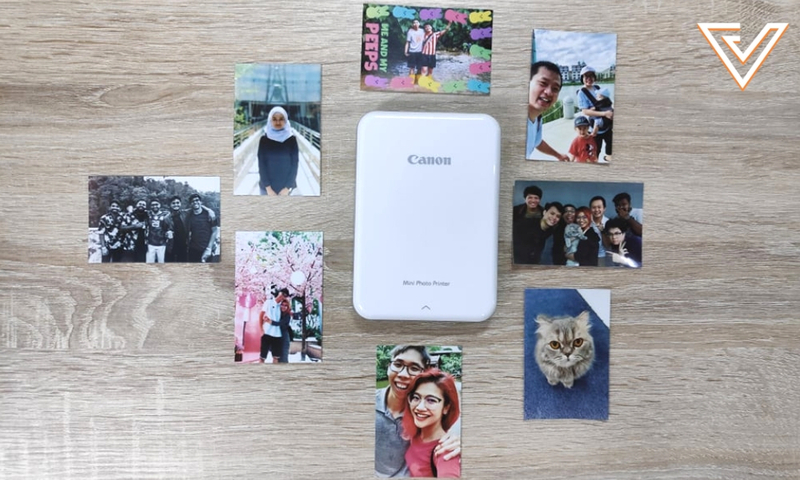 The Canon Mini Photo Printer was launched officially in mid-December 2018 and retails at RM459/SGD189 on their official store in Lazada. It utilises ZINK, or Zero Ink Technology, a revolutionary dry-printing technology that enables printing in colour without the use of ink cartridges. 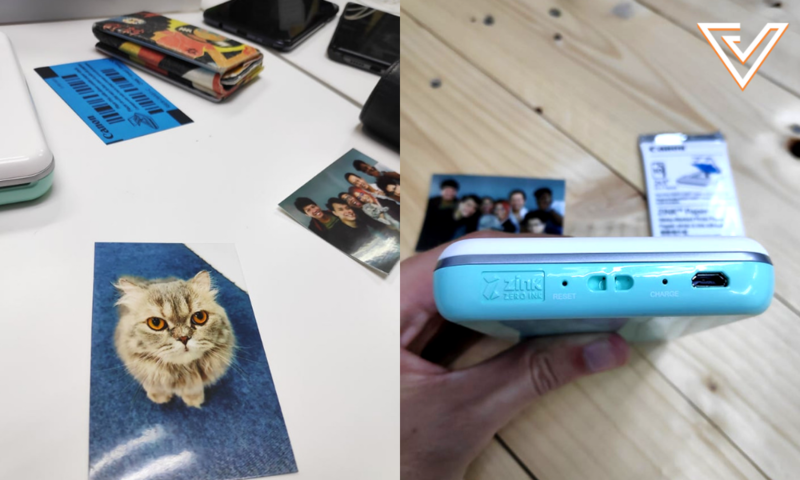 When I first heard about Canon releasing a new mini printer, I wasn’t too excited because I thought it would just be a conventional printer that uses the typical ink cartridge to print pictures but just that it’s smaller. 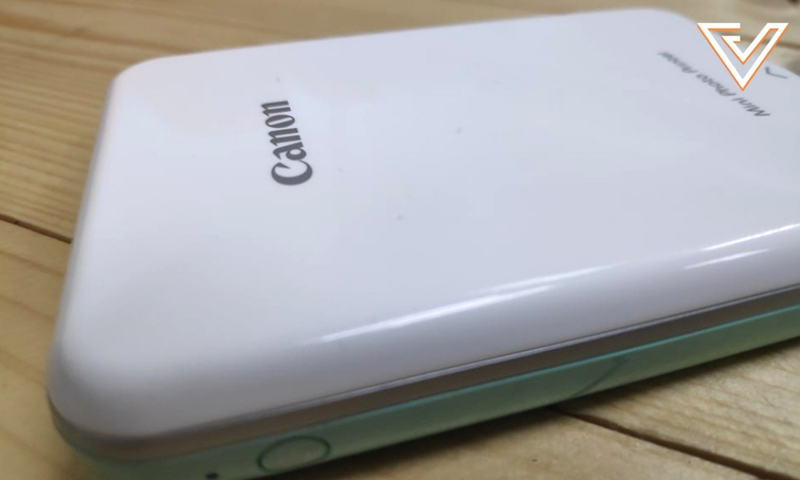 However, after getting my hands on a unit of the Canon Mini Photo Printer, I was surprised as it was as small as a power bank and there was no need for ink to be used. 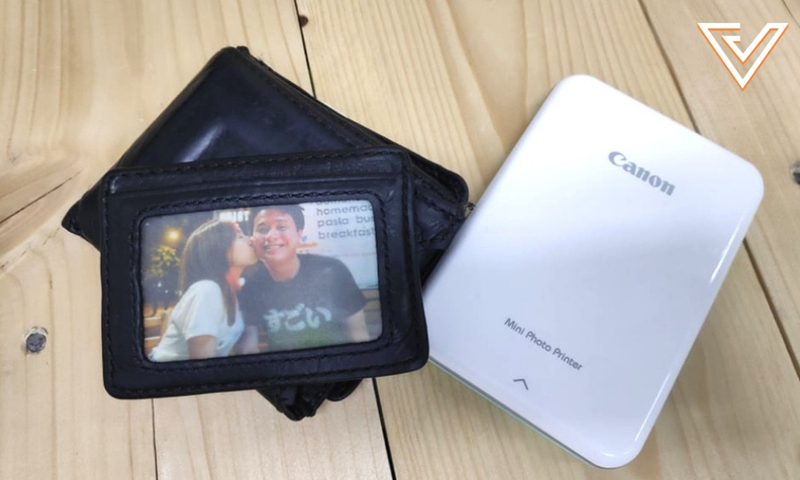 The Canon Mini Photo Printer device. It sounded like it worked similarly to a Polaroid instant camera where after you take a picture, it’s instantly printed and all you have to do is shake the film for a few seconds to dry it. Only thing is, there was no camera this time, and instead connected to my phone’s Bluetooth. Since this was the first time getting my hands on a mini printer that doesn’t require ink, I went ahead and tested it out and printed a bunch of photos to see if the quality was up to par. Before even using the printer, I had to charge it with a micro USB cable that came together in the box. I also had to download the Canon Mini Print app on my smartphone as you can only print through the app. After that, all you need to do is pop open the mini printer and insert the blue coloured ZINK Smart Sheet below the film. Then turn it on and open the app to connect your smartphone to the printer through Bluetooth. It connects quite seamlessly and you can then choose a picture from your phone to be printed. You’ll then be presented with plenty of options to edit the photo within the app. 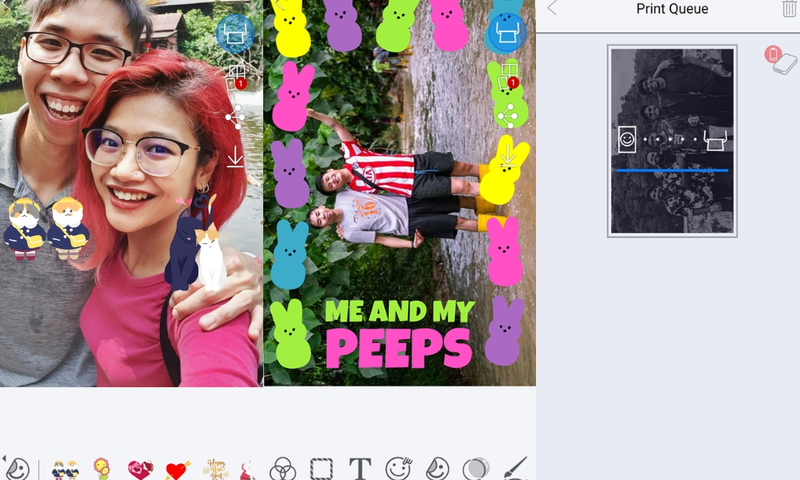 Such as basic brightness and saturation, adding borders, adding texts, filters and also emojis. A look at the Canon Mini Print app. I chose to add a border for a picture of me and my colleague, but I had problems with the editing tool as it’s not very user friendly. Hence, most of the photos that I printed were unedited. After editing, it takes approximately 50 seconds for the picture to be printed which is quite a long while, however the picture came out with the right colours and was worth the wait. Left: how the pictures turned out, Right: The USB port on the end of the printer. According to Canon, the mini printer works with ZINK Zero Technology from Zink, this technology works in such a way that printers don’t need ink to function but it just requires a certain type of film. You won’t need to worry about touching it accidentally as there’s no need to dry it because it doesn’t work like Polaroid instant cameras. The photos that come out are smudge-proof, water-resistant, and tear-resistant with a sticky back. As much as it sounds like magic, it’s not—the people behind Zink have invented a paper that already contains all the “ink” necessary to make a photo. Each sheet of the Zink paper contains dye crystals: some that can turn cyan, some that can turn magenta, and some that can turn yellow. These crystals are undetected by the naked eye and, before printing, are colourless. To activate this untapped, unseen “ink” in the crystals, all the printer needs to do is add heat to the equation. Heat causes a chemical reaction in these specially designed crystals, turning them from colourless crystals to richly colored dye, and voila the photos are printed. The pictures that were printed with the photo. For a mini printer, I’d say that it simplifies printing, as the advantage of having Zink technology means that there’s no middleman medium required (the ink)—the only materials it needs are the paper and printer. Furthermore, it’s small and lightweight, almost as big as a conventional powerbank and much lighter, so the only thing you need to worry about is having enough paper to print. As someone who doesn’t really take pictures all that often, I don’t think it’s something that I would buy as it can be quite pricey at RM459 or SGD189 on Lazada. The photos that are printed out fit perfectly into wallets. However for those who love to take pictures and print them out for the memories, I’d recommend you get it as it’ll be worth the investment. The best part is that the pictures perfectly fit into wallets and you can even stick it on tables or boards to keep it as a memory. 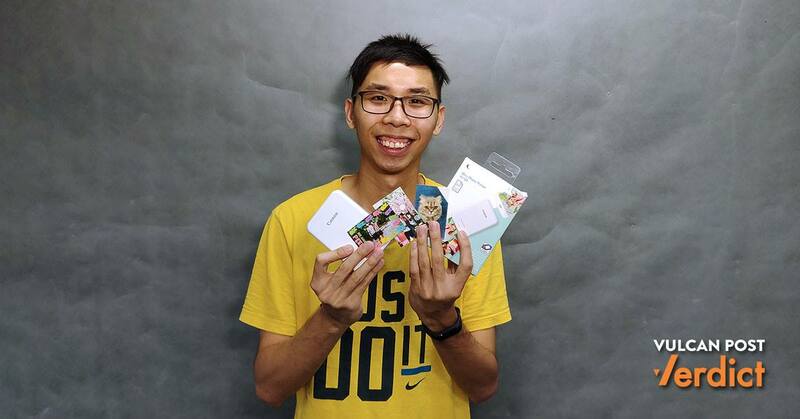 The Zink paper costs around RM1 to RM2 or around SGD0.75 per piece (depending on where you buy from), on the Canon Lazada official store it costs RM25 or SGD15 for a pack of 20 sheets, which costs around RM1.25 or SGD0.75 per piece of Zink paper. If you would like to find out more about the Canon Mini Photo Printer, you can check out the website here.